When you're twelve, the end of the world comes in many different forms: it's missing the ball, fighting with your best friend or, for Hany Abdullah Peter Soussa, transferring from a private school to a public one. After a childhood of security and privilege, Hany's idyllic world is disrupted when his father suddenly dies. To cut back from spending more than they could afford, Hany and his mother decide to transfer him from a private school to a public one, where he fits in as comfortably as a sailor does in a desert. Amr Salama's charming coming-of-age film follows Hany as he cleverly tackles loneliness, loss, identity, and the reconciliation of the culture he comes from and the one he dives into. 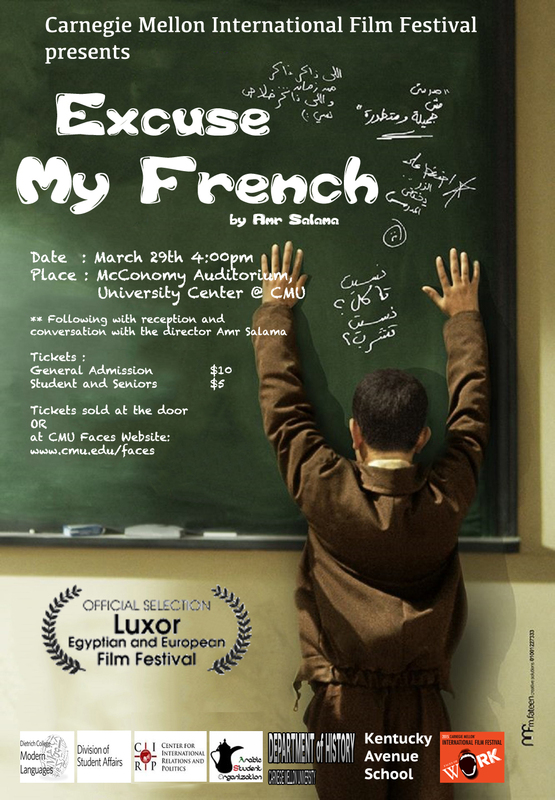 Instead of falling prey to somberness and politics, Excuse My French gives light to a heartwarming, clever story of a young boy growing up and embracing what life gives him. Director Amr Salama will attend the event and engage in a pre- and post-screening discussion. Reception will follow the screening. Topics of interest: Film Studies, Arab Cinema, Screening Policies since 2009 to the Present, Arab (i.e.Egyptian) Culture, Egyptian Public Education, Coptic Egyptians.